I was taking Ray to "school" on the way to work but had to swing by the post office to mail my mother's day present. The P.O. wasn't open yet but I knew I could use the automated teller and be in and out in five minutes. 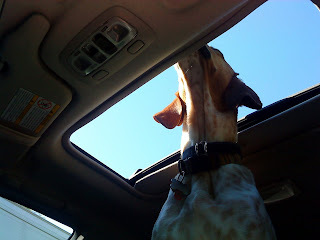 I opened up the car widows and the sun roof, told Ray to "stay" and zipped into the post office. When I came back out, Ray was curled up in the drivers seat, ripping at something. I realized that I had left his "lunch" (a baggie with treats in it) on the passenger seat with his leash (am I EVER going to learn?????). He hadn't had time to eat the treats, only time enough to destroy the bag. "Oh, Ray," I said, as I grabbed his collar and made him jump out so that he could get back into the back seat, "You know you're too young to drive." 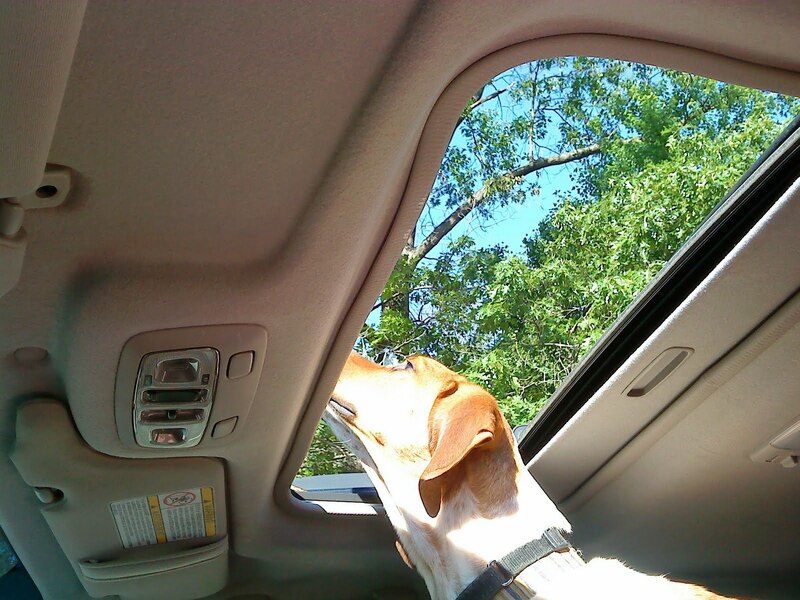 I figured he was like his namesake and just wanted to take a short drive to prove that he could do it. But first he needed a snack to fortify himself for the trip. I started off again but Ray knew those treats were still in the front. He put his front paws on the center console and tried to climb over the seat (it's a good thing we were on a back road). I kept one hand on his chest and one hand on the wheel as I drove slowly down the street. All of a sudden Ray realized that the roof was gone and the sun was shining on his head. 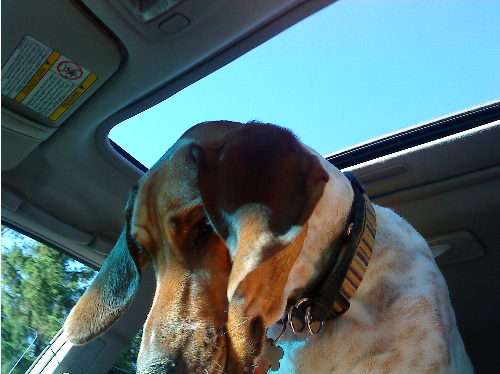 Treats forgotten, Ray stuck his head out the sun roof. All I could think of was every T.V. show or movie I'd ever seen where the vacationer/visitor/rube has to sit hanging out of the sunroof of the limousine as it tools around Las Vegas or Los Angeles or New York (or wherever). Ray was having a great time. I wondered what it looked like from the few cars that drove by as we eased on down the road. Sitting here at my desk working wondering when I am going to win Powerball so I can quit. When I log onto Ray the Blind Dog, it is like taking a smoke break. It makes you feel good and always puts a smile on my face. 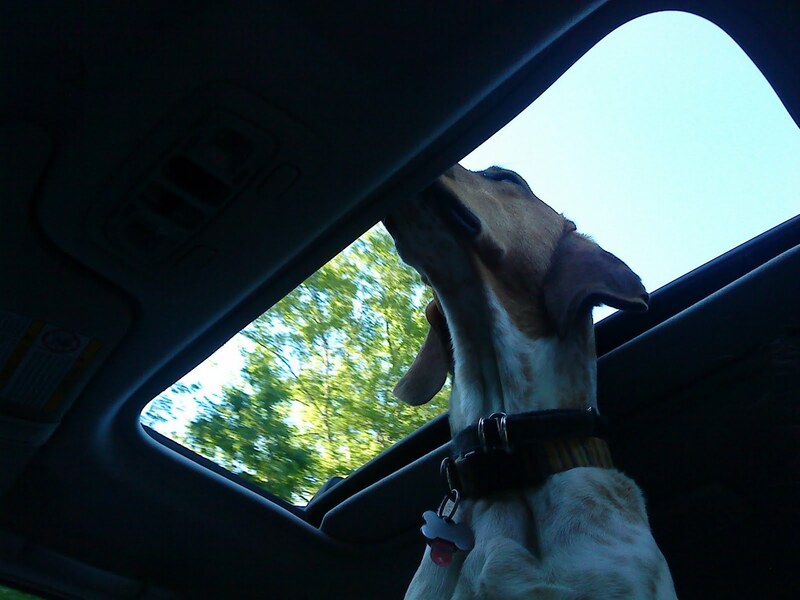 I just wish I was the one in the car with my head stuck out the sun roof. Not that I smoke.